Last time you went to a state park, what did you come home with? A sunburn, a handful of mosquito bites and some great memories? Susie Clark came home from her trip to a state park with something a little more unusual (and lucrative): a 3.69-carat diamond, which she dubbed “the Hallelujah Diamond” since it was an answer to her prayers. 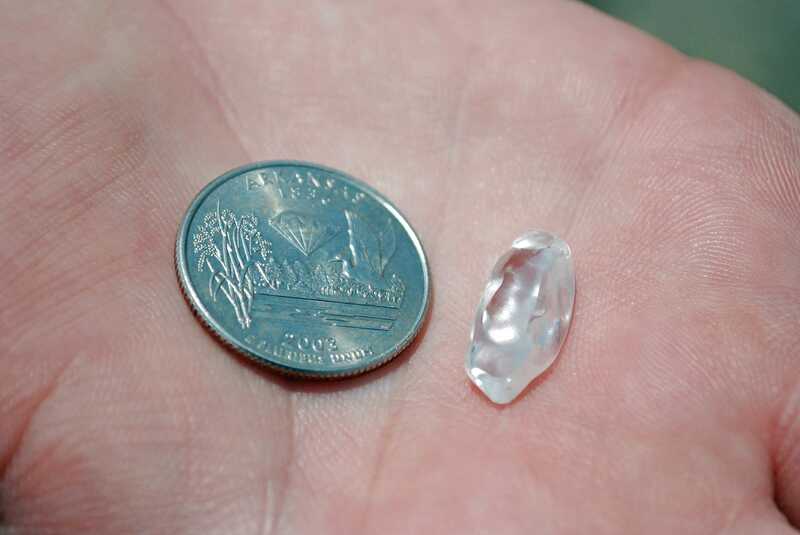 And on June 24, Bobbie Oskarson found an 8.52-carat jewel she’s calling the “Esperanza Diamond” after her niece. These women didn’t stumble upon the gems in any old park, though. They visited the Crater of Diamonds State Park in Murfreesboro, Arkansas — a well-known place to find jewels. Gem hunting is the primary activity for visitors at Crater of Diamonds, and people have found more than 75,000 diamonds since the first one was discovered in 1906. Ancient volcanic eruptions created all gems in the area. It’s not just diamonds; you can bring home more than 40 other types of rocks and minerals, including jasper, amethyst, peridot and garnet, since the park has a “finders keepers” rule. Your chances of finding a gem with some diligent searching are pretty good. When Clark found her Hallelujah Diamond on April 23, 2015, it was the 122nd stone found at the park this year. Oskarson’s is the 227th. According to the park’s list of recent diamond finds, people find sizable diamonds almost daily. No official dollar figure was released on Clark’s or Oskarson’s finds, but another woman sold a 3.85-carat diamond she found at the same park for $20,000. The largest diamond found since the site became a state park was a 16.37-carat white diamond found in 1975. How Can I Find Diamonds? To search for diamonds as well as other semi-precious stones in the park, you first need to plan your trip. The park is located about 120 miles from Little Rock, Arkansas. It is open daily except for Thanksgiving, Christmas and New Year’s Day, though hours vary according to season. You can even bring your dog as long as you keep it on a leash. The park contains a 37.5-acre plowed field, which the website says is “the only diamond-producing site in the world open to the public.” Workers plow the field from time to time to bring more diamonds up to the surface. They don’t announce the plowing schedule, but it typically happens once a month or so, except in the winter. Here’s how to make the most of your trip. It costs only $8 for an adult all-day diamond-hunting pass, while kids aged six to 12 can search for $5, and kids five and under are free. If you buy a ticket after 6 p.m. between Memorial Day and Labor Day, you can search until the park closes at 8 p.m. and get in for free the next day as well. Organized groups of 15 or more people can receive half-price tickets if they notify the park in advance. However, family and friend groups don’t count for these half-price tickets, which are meant for school groups and Scouting trips. While you don’t necessarily need tools to find diamonds, many people like to use them to increase their chances of finding the gems. You’re welcome to bring your own tools from home, though the park also has a variety of tools available for rent or purchase. Popular tools include full-sized shovels, flowerbed trowels and sifting screens. You can rent a small wooden box screen or a plastic bucket for $3 a day. Save your knees with knee pads, available for rent at $4 a day. A “basic diamond-hunting kit” including a folding shovel, screen set and a bucket is available for a $10 rental fee. Save yourself these fees by bringing your own small bucket, shovel and piece of window screen from home. You won’t want to wear your finest duds out into the diamond field where you’re pushing dirt around all day. If it’s rained recently, be sure to wear old shoes or boots since the field can become very muddy. If the sun’s out, be sure to wear a hat and sunscreen, since you’ll be out in the open. The park’s website has a guide to what diamonds look like in the rough, which notes that the diamonds found at the site are usually smooth and well-rounded, about the size of a match head to a green pea, and have an oily film as well as a metallic luster — they won’t be clear, like the ons you see in jewelry stores. Diamonds come in white, brown and yellow, and employees are happy to identify, weigh and certify your finds at the Diamond Discovery Center free of charge. Expert searchers recommend three main techniques for searching. The first is surface searching, which is simply walking around and looking for diamonds on top of the dirt. After a hard rain is the best time to use this technique since the downpour often washes soil away, leaving gems exposed. Other searchers use screens to sift the top six to 12 inches of soil. A hand tool is helpful here as well. The last method is to dig deep holes, remove the soil and wash it through a series of screens. This is a method typically used by experienced diamond hunters. And, after your diamond searching is complete, you can enjoy the typical amenities of a park, including interpretive programs, history walks, hiking trails and fishing. What’s not to love about spending your weekend there? Your Turn: Have you visited Crater of Diamonds State Park? If not, would you plan a trip there?